Nanango residents had the opportunity on Wednesday night to see a preview of the $2 million upgrade planned for the former Shire Chambers building on the corner of Henry and Drayton streets. 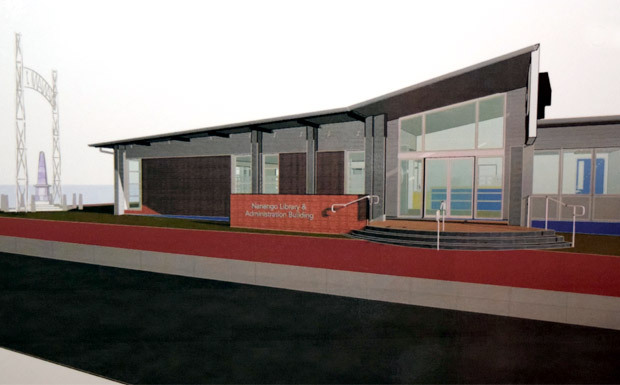 Work on the project will begin soon, which will mean the relocation of the library and the Visitor Information Centre, as well as Council staff shifting into the Town Common Hall in Kingaroy. 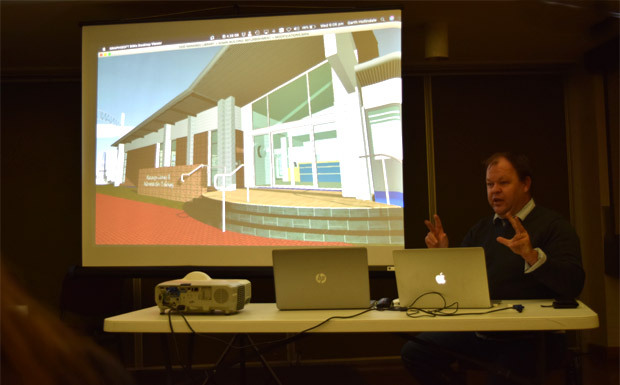 South Burnett Mayor Keith Campbell and architect Garth Hollindale unveiled the new design to an audience of about 25 people who turned up at the Nanango Cultural Centre. Mayor Campbell said Council had looked at several options for the building, which houses Council’s engineering department as well as the Customer Contact Centre and library. Council could spend $4 million to demolish it and start afresh or refurbish the current structure for half the price. Mayor Campbell said Council had opted on refurbishment which should extend the life of the building for another 30 years. Work on the project, which does not include the Nanango Cultural Centre wing, was expected to begin in the next five weeks. Mr Hollindale said his firm, Hollindale Mainwaring Architecture, had been given a brief to modernise the building, but also to respect the architectural history of the town. They had also been asked to simplify the roof structure. Several additions to the building over the years had led to frequent roof leaks and expensive repairs. The company had examined the architecture of both the original building and iconic properties in the district. Mr Hollindale said they had chosen a new facade that would respect the building’s modernist style, but also open up views to the Drayton Street cenotaph and the Nanango town sign. He then showed the audience an external and internal 3D walk-through of the building to demonstrate how the finished project would look. The library would be moved from its current location to the Henry Street end of the building with a bank of windows overlooking the cenotaph. The building’s main entry would remain but handrails would be added to the steps and the access ramp would be upgraded. Inside, a central desk would accommodate both library and customer service staff. Library users would enter a modern, expanded facility with a common area, a separate small meeting room and computer work stations. A disabled toilet would also be added. The remainder of the building would house Council staff and, for security, would only be accessible by keycard. Mr Hollindale said his firm would retain as much of the building’s original structure and materials as possible, particularly on the building’s facade. However, it would also be installing a 3000-gallon water tank and modern, energy-efficient air conditioners and lighting which should help reduce the building’s energy footprint. 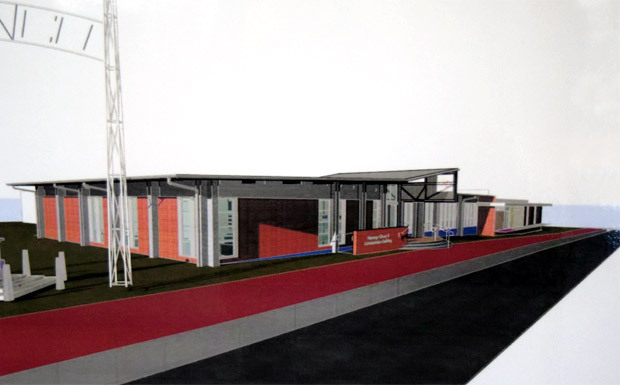 Mayor Campbell told the audience the library would be moved into the Nanango Energy Centre and the Visitor Information Centre would be shifted to Ringsfield House while the building work – which was expected to take six months – took place. Staff would be moved to other Council offices around the region. A large contingent would be housed in a temporary workspace at Kingaroy’s Town Common Hall. Acting CEO Lester Schumacher said Council preferred to use its own facilities to house staff rather than hire temporary premises. It was more economical to move staff out of Nanango for six months than hire temporary premises and wire them up to Council’s IT systems, he said. In a question-and-answer session, several residents said they would like the current main entrance doors, the former Nanango Shire Council meeting room desk and the bronze plaques affixed to the outside of the building preserved. Council’s Strategic Projects Manager Leanne Petersen said these requests would all be considered and, in the meantime, the objects would be stored safely. Volunteers from the Visitor Information Centre expressed concerns about moving some of the Energy Centre’s displays, but were assured by Ms Petersen that these, too, would be safely stored and returned to the Energy Centre undamaged once the library moved into its new home. However, the Visitor Information Centre may not be returning to the Energy Centre. Ms Petersen and Mayor Campbell said the six-month shift to Ringsfield House would yield data that could be used to assess if the Energy Centre was the right location for the VIC or if Ringsfield might be a better choice. 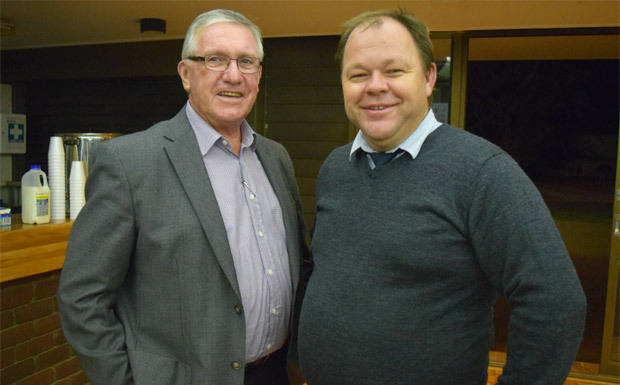 Mayor Campbell said Ringsfield was a constant drain on Council’s finances, and Councillors were keen to look at extra uses for the complex that might justify the cost. However, he understood the concerns of VIC volunteers who believed Ringsfield House might not be a suitable location for visitors with caravans. Mayor Campbell said Council would take all factors into consideration when the refurbishment project ended to determine the best way forward. Great communication skills from council.